For many homeowners, the presence of a healthy, lush, green lawn is a sign of pride and a symbol of a beautiful home. Regular watering is one way to keep your lawn looking as good as it can look. 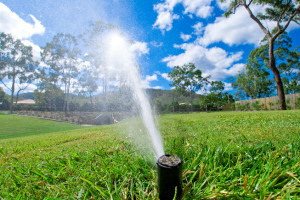 If you neglect to water your lawn, especially when the weather is hot and dry, your lawn will suffer and wilt away, which can cost you a lot in repairs and reseeding. If you are not sure how much watering is required for your lawn, talk to a professional lawn care service. Use the following advice to make sure your lawn remains healthy. Not only will this help with the conservation of water, but it will help keep your lawn healthy. Overwatering can cause a lot of damage to your lawn, and can lead to the development of fungus and disease that could otherwise be prevented. Check if footprints linger when you walk on the grass, and look for a blue-gray tint to tell you when watering is necessary. Avoid overwatering and you will be left with a strong, healthy lawn. If you water shallow consistently, you will be at greater risk for weed germination and draught, as the roots will not grow as deep and the grass itself will be weaker. Whether you are manually watering or using a sprinkler, measure how deep the water goes. Six to eight inches should be normal for most grass types, and if your soil is not damp that far down, try watering for longer timeframes. The best time to water your lawn is in the early morning or in the evening, when the weather is cool and not too hot or dry. If you water your lawn while the weather is too hot, the water will evaporate and your lawn won’t get the amount it needs. To avoid evaporation and make sure your lawn gets the amount of water it needs to stay healthy and strong, put the sprinkles on during the cool hours of each day.